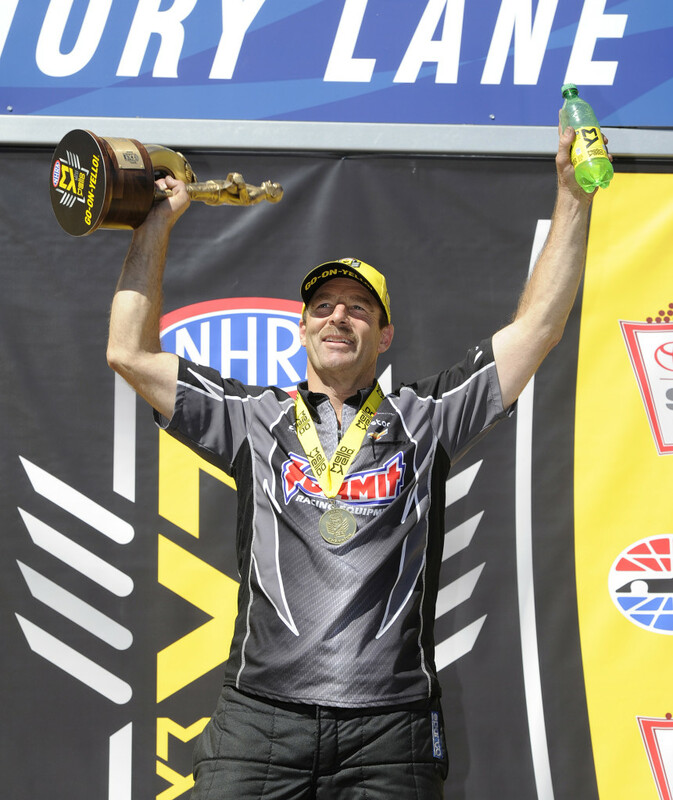 Carrying the memory of his good friend Eric Medlen to the finish line, J.R. Todd finally broke through to win his first Top Fuel event this season on Sunday at the NHRA Toyota Sonoma Nationals in front of a live national FOX television audience and sell-out crowd at Sonoma Raceway. 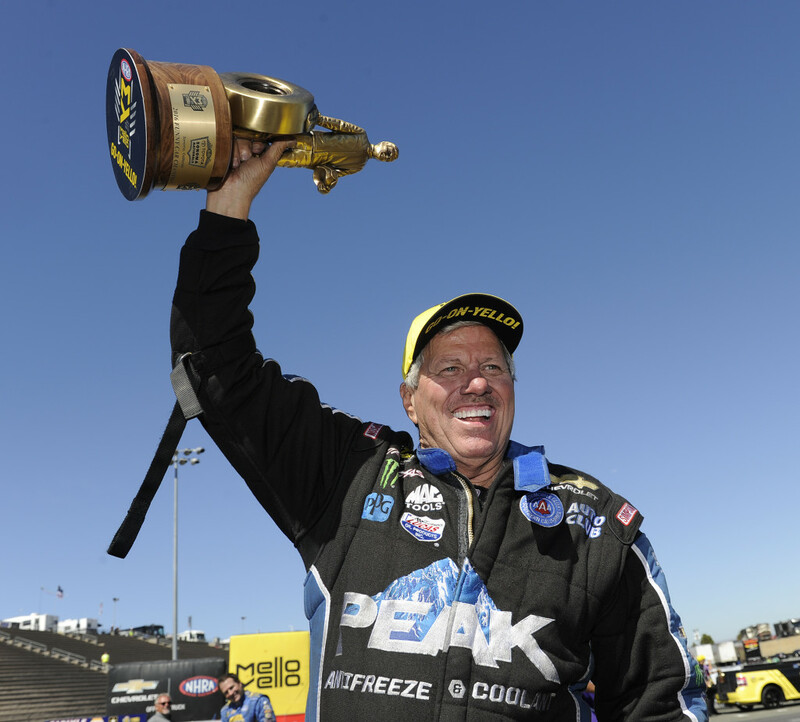 John Force won his 145th Funny Car victory, leaving only Seattle in front him before he can claim a second Western Tour sweep. The KB Racing Pro Stock team returned to form with Greg Anderson winning in a record tying 85th win equaling that of legend Bob Glidden. L.E. Tonglet upset Andrew Hines in the Pro Stock Motorcycle finals after taking down both powerful Harley-Davidsons to reach his win. The day meant something special to J.R. Todd. 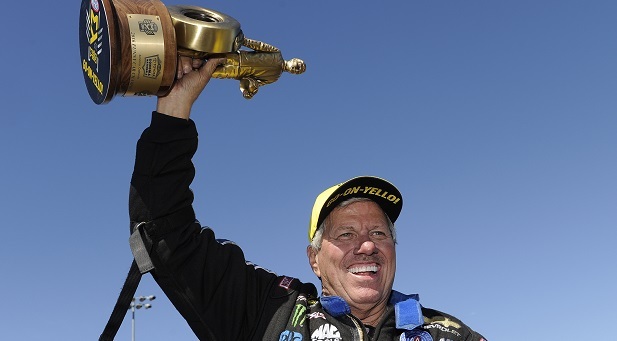 He hadn’t won at Sonoma in 10 years and all that time, he kept the spirit of famed Funny Car racer, Eric Medlen deep in his thoughts and it was that momentum pushing him to win his ninth career Top Fuel victory. 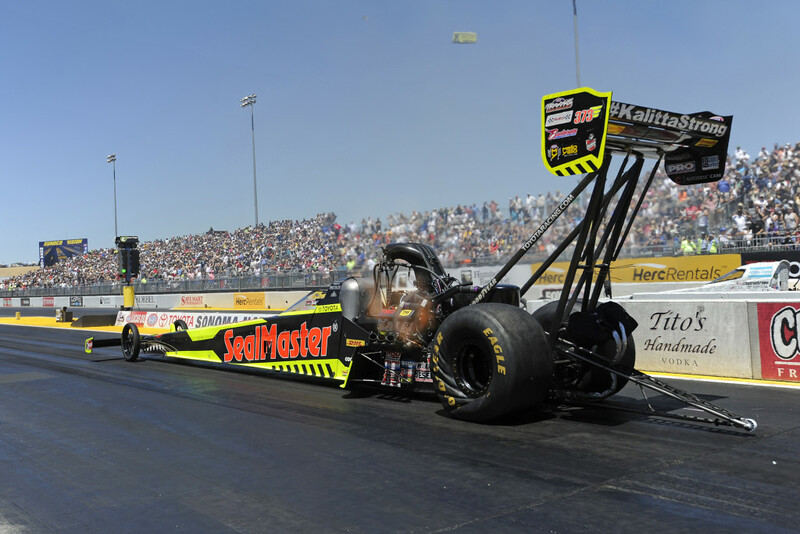 In the last four Top Fuel events, Todd has been to three final rounds and this time, it was against the formidable Richie Crampton for the Northern California title in wine country. His SealMaster Connie Kalitta Motorsports team reeled off three 3.74s in eliminations to defeat Clay Millican, Antron Brown, and Doug Kalitta using a time of 3.745 seconds, 324.83 mph to beat Crampton against his pass of 3.806 seconds, 313.07 mph to seal the deal. The post-race Eric Medlen Ice Cream Social on the Sonoma road course was again a hit with the fans. His words of ‘nobody can be down when you’re eating ice cream’ still lives on after 10 years and just as strong after his sudden death in a Funny Car testing accident in Gainesville, Fla.
Antron Brown still holds a 37-point lead over Doug Kalitta with only three races before the start of the Countdown in Charlotte. Steve Torrence set a new Top Fuel National Elapsed Time in Friday night qualifying recording a very swift pass stopping the clocks at 3.671 seconds, 326.08 mph. It was Torrence’s eighth No. 1 qualifier in the first 15 races in 2016. 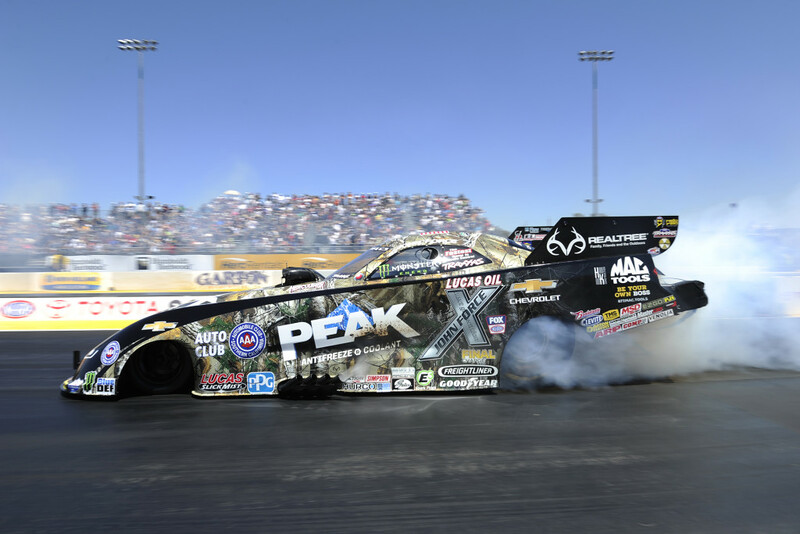 At 67-years old, most people are slowing down, but for 16-time Funny Car racer, John Force, it’s anything but that. He again, turned up the wick this time against Ron Capps in his Peak Anti-Freeze Chevrolet at the NHRA Sonoma Nationals to win his second consecutive race in 2016 leaving only Seattle’s Northwest Nationals away from claiming his second Western Swing sweep, a feat he first accomplished in 1994. It was Force’s 145th victory and 1,251st round win of a career that began in the 80s. 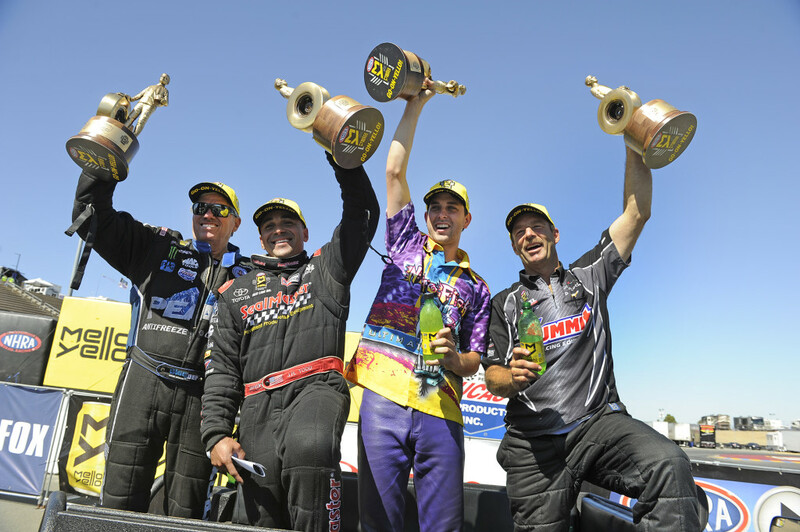 It was his eighth Sonoma fuel coupe win and in the finals against Capps, Force felt right at home. It was a tight side-by-side finish with Force mustering together an impressive 3.948-second pass at 324.59 mph to hold off Capps with his nearly equal run of 3.960 seconds, 320.13 mph. In his earlier rounds, Force defeated Alexis DeJoria, son-in-law, Robert Hight and daughter, Courtney to reach his 244th final round appearance. With his fortunate recent run of luck and skill, Force has moved from ninth to fifth in the Mello Yello points, but its still Capps in the lead by 130 over Courtney Force. 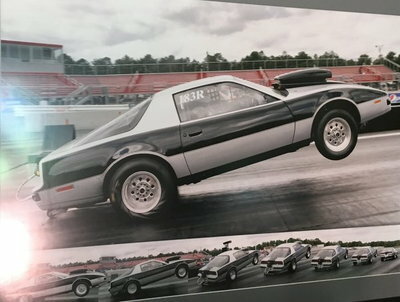 In other Funny Car news, Kalitta Motorsports Tequila Patrón driver, Alexis DeJoria suffered injury after slamming the retaining wall in the left lane racing against John Force in the first round. 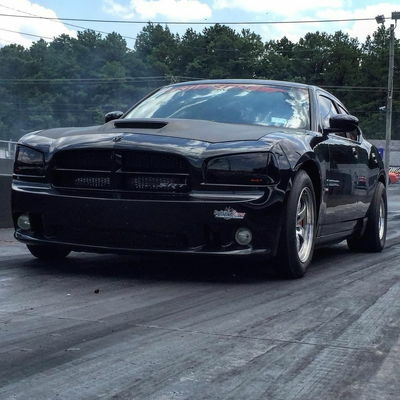 DeJoria exited the vehicle under her own power, but immediately knew something was wrong. Upon a quick evaluation from on-site medical personnel, she was transported via ambulance to Queen of the Valley Medical Center in nearby Napa. After x-rays and a CT scan, doctors diagnosed DeJoria with a high-energy fracture of the left pelvis. The fracture was caused when she struck the wall. The injury does not require immediate surgery, but is extremely painful. 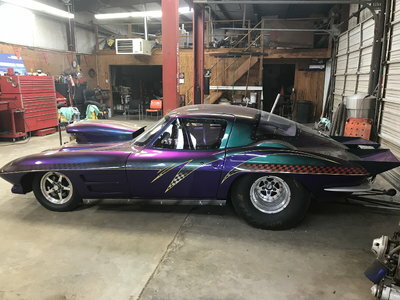 DeJoria is in good spirits and was more concerned with the condition of her race car, and if it was ok. She was released from the hospital on Sunday afternoon, and will start intense physical therapy as soon as possible, determined to get back on the track. 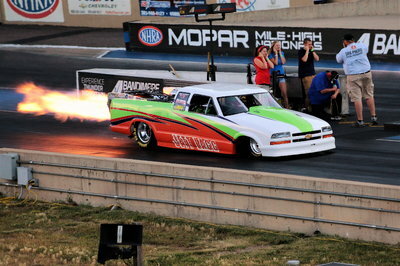 DeJoria is scheduled to compete next at the NHRA Northwest Nationals in Seattle, Washington, but due to injuries sustained, that race is to be determined. In Pro Stock, it was a magical day for Greg Anderson. He continued his dominating season in his Summit Racing Equipment Chevy Camaro when he defeated his KB Racing teammate Bo Butner for his seventh win of the season. 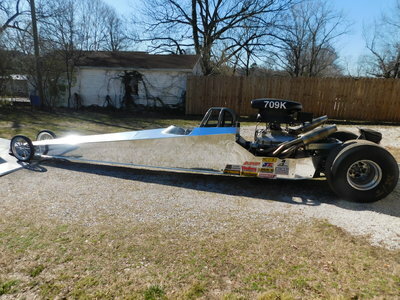 Anderson, who notched his 85th win, raced to victory with a pass of 6.580 seconds at a 210.54 mph to the trailing run of 6.622 seconds at 210.70 mph, by Butner. 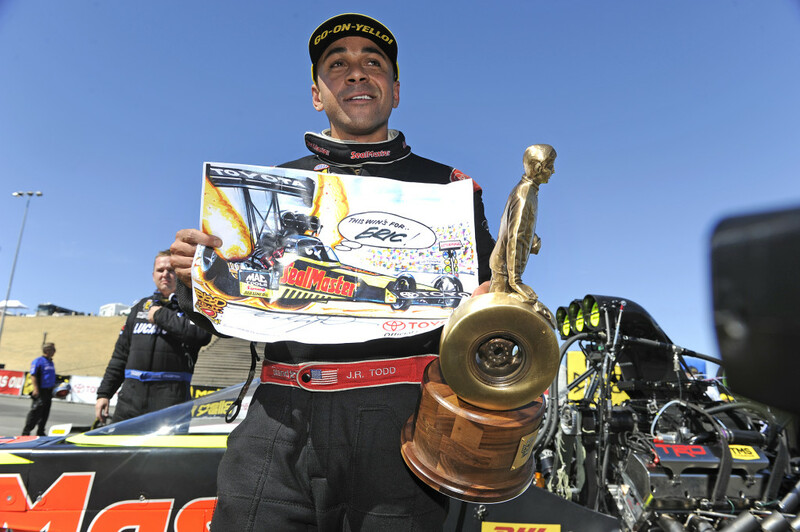 The win ties Anderson with drag racing icon Bob Glidden as the second winningest Pro Stock racer in history behind Warren Johnson with 97 victories. This is the fifth career win at Sonoma for Anderson and he is now the Pro Stock points leader passing Jason Line by a mere four points. Pro Stock Motorcycle racer LE Tonglet won his first race since the Brainerd event in 2011, defeating Andrew Hines in the finals for his 11th victory of his career. 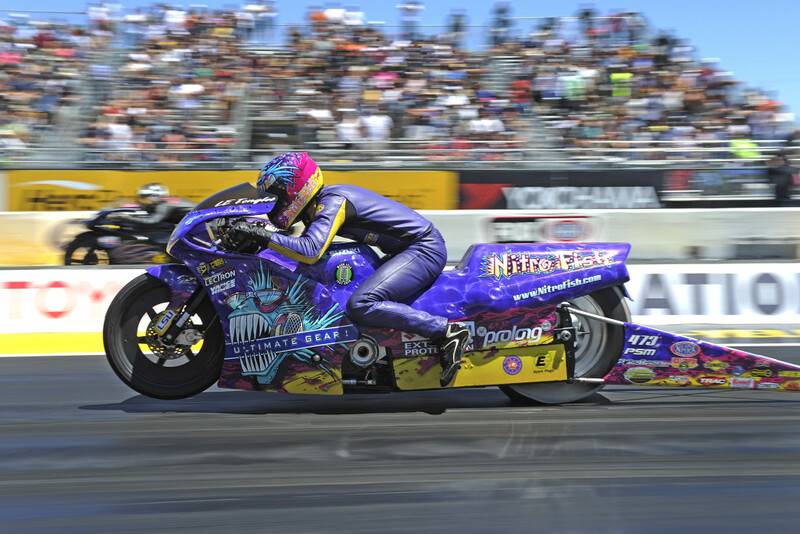 Tonglet, who is the 2010 Pro Stock Motorcycle world champion, had the winning run of 6.813 seconds, 196.73 mph to the Harley’s losing run of 6.864 at 194.52. Tonglet faced Katie Sullivan, Hector Arana, Eddie Krawiec and Hines to capture the win. Eddie Krawiec holds an 89-point lead over Andrew Hines with the Countdown to the Championship on the horizon, three races away. The NHRA Mello Yello Drag Racing will resume Aug. 5-7 with the Protect the Harvest NHRA Northwest Nationals at the Pacific Raceways in Seattle.